Slideboom.com is a place where you can host your PowerPoint presentations or search for presentation that have been uploaded by other users. The website is very easy to use and quickly uploads presentations. Slideboom is a great tool for sharing your presentations with other educators and students. Also, if you create a presentation at home or at school, just upload it to slideboom and you can access it from any location. I hope you find slideboom.com as easy to use and useful as we have. 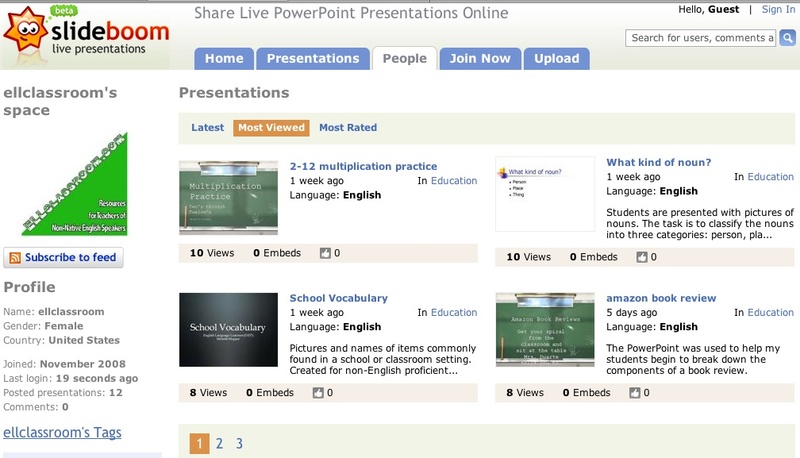 If you would like to look at the presentations we have uploaded, you can find them at slideboom.com/people/ellclassroom. Feel free and please download them and modify the presentations to meet the needs of your students.